It was also painfully time consuming and a major reason why early animations were nothing more than short films. 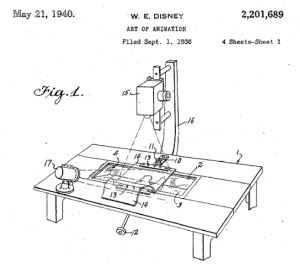 Filed for patent as “The Art of Animation” September 1, 1936, Disney’s game-changing multiplane camera solved the problem of creating depth and perspective while revolutionizing the animation process in one fell swoop. Inspired by the layout of a theater stage, the new device allowed characters, props, scenery, and stationary backdrops to be placed in different layer with actual space between them (photo, right). It allowed animators to create more realistic, higher quality films. But don’t take my word for it. See it from the man himself. Straight from 1957, here’s Walt Disney’s short film about the multiplane camera. Mickey’s there to help, too! The multiplane camera invention allowed Disney to realize his dream of producing a feature-length (and feature quality) animated film. Snow White and The Seven Dwarfs, was the first feature length animated film. It was the first feature produced with multiplane technology, and it was the first animated feature to be colored in the new Technicolor process. 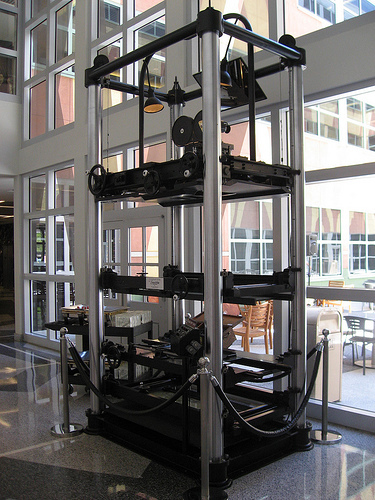 The multiplane camera was last used on Disney’s The Little Mermaid in 1989, after which it was replaced by digital multiplane technology. Today, Disney’s original twelve-foot-tall creation is on display at the Disney Studios in Burbank, CA.